Nearly two months have past since a five-alarm fire destroyed three small businesses on University Avenue in the Bronx. As of now, only one is rebuilding, said the Bronx Small Business Development Center. When Esther Yeboah stood across the street from her consignment store on Dec. 17 of last year, a five-alarm fire had engulfed the Bronx block in thick black smoke. She couldn’t see if her business was still standing on University Avenue. Fires are the most common disaster for small businesses in the Bronx, and they happen more often in the wintertime, reports New York City’s Office of Emergency Management. But other disasters, like water main breaks, power outages, construction accidents, hurricanes and terrorism threaten the city year-round. That’s why it’s crucial for you to make a disaster preparedness plan for your business, city and disaster agents say. Yeboah was able to reopen her store after a few days, but other stores on her block were leveled and remain closed two months later. Eighty percent of companies that don’t recover from a disaster within a month go out of business for good, says the U.S. Small Business Association. 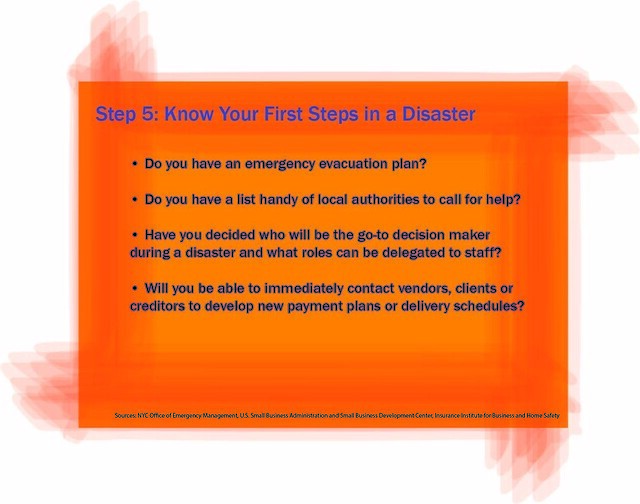 Preparing for emergencies is especially important for the Bronx’s economy, said Fernando Tirado, disaster recovery advisor at the Bronx Small Business Development Center. “Small businesses are the lifeblood for their community,” Tirado said. Most companies in the borough are small businesses, and they employ more than half the private workforce in one of the state’s lowest median incomes areas, he added. Fernando Tirado, disaster recovery advisor at the Bronx Small Business Development Center, explains how City Island and other commercial areas in the borough were affected by Superstorm Sandy in 2012. “Business owners don’t understand FEMA. They really think that FEMA is going to just come and bring them a check,” said Bernadette Nation, executive director of New York City’s Small Business Services emergency response team. But this is a myth, Nation said. In most cases, relief comes in the form of a low-interest loan that business owners must apply for by proving their losses. This can be difficult in the Bronx, where Tirado said an “epidemic” number of businesses don’t keep records. So make sure to keep at least three years of tax returns handy, as well as receipts for your equipment and inventory. Don’t stop with backing up your tax returns and receipts. Think about the other records and licenses you need to run your business every day. You should keep copies of important documents online, offsite or in fireproof and waterproof boxes, said Ira Tannenbaum, assistant commissioner at the city’s emergency management office. He said 93 percent of companies that lose access to their data for more than 10 days because of a disaster go bankrupt within a year, according to the U.S. Bureau of Labor Statistics. Tannenbaum remembers when a steam pipe explosion in Midtown a few years ago kept a couple from getting into their sandwich shop. They didn’t have a backup record of their vendors’ contact information at home. “By the time they got back, they found two day’s worth of deliveries in front of their store that were no longer good,” Tannenbaum said. Any time an emergency hits, your business will face losses. But having the right insurance can help minimize the hit. The Stuyvesant Yacht Club on City Island lost a quarter of their members’ boats during Hurricane Sandy. Over two years have passed, but the125-year-old business said delays in financing are still making it difficult to recover. Review your insurance policy now and make sure you know exactly what it covers, recommends Tirado. This is especially true in the Bronx, he added, where many immigrant business owners may not understand how insurance policies work in the U.S. In an emergency, your employees are your best resource to help get your doors back open quickly. But don’t overlook your staff’s personal needs, said Tannenbaum. The better prepared your employees are to face a large-scale disaster on their homefront, the more willing they will be to pitch in at your company when you need them the most. “Do you want them there helping you or do you want them in line at ShopRite trying to buy water and canned food for their family?” said Tannenbaum. Even with good employees to support you, it’s easy to feel alone when going through a disaster. That’s why you should join a business organization in your community, said Michael Nixon, a credit analyst at the Bronx Overall Economic Development Corporation. Nixon said business owners who are part of a merchants association may be able to speed up their recovery. The Bronx has over a dozen merchants associations throughout the borough. “They’re better placed to overcome a disaster, to put pressure on local officials to expedite help, bring in banks for a forum for loans or have resources to rent out temporary space,” Nixon said. After last December’s University Avenue fire almost destroyed the pain clinic she manages, Daisy Lopez said she understands it’s hard for business owners to think about the recovery process. The most important step you can take to prepare your business for a disaster is to simply think about the “what ifs” now, said Tirado. Many Bronx business owners are mom and pop operations that don’t have a lot of spare time, but a little planning goes a long way, he added. Preparing for a disaster doesn’t need to be expensive or time consuming. In fact, every $1 spent in preparedness saves about $7 spent in recovery, says the IRS. Start with these 5 tips to help make your business more ready for a worst-case scenario.